A bit about my family history research, a lot about my digiscrapping, some photos of people and places I love, and a bit about my other interests. 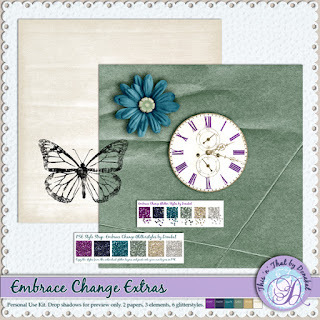 The third and final round of the Next Designer Contest at Digital Scrapbooking Studio is now underway and my kit is posted and ready for downloading (links in the gallery). 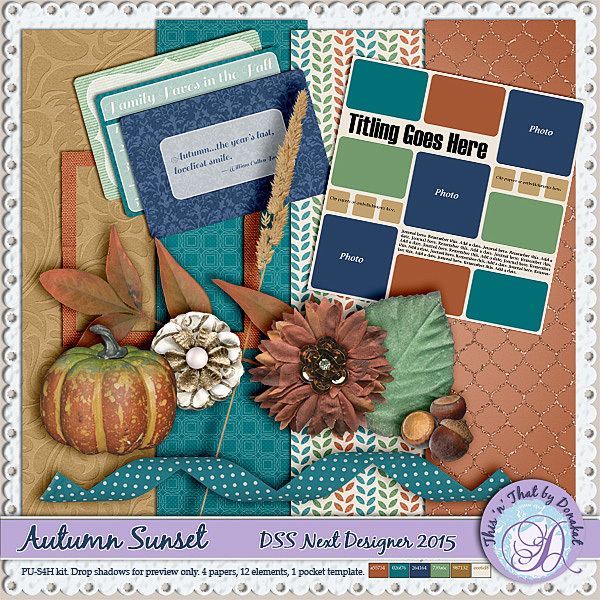 I just love this palette of copper, teal, and gold, and hope it works well for your layouts for fall (and anything else). The bonus this round is a full template (pocket scrapping style) and journalcards which fit into the spaces. 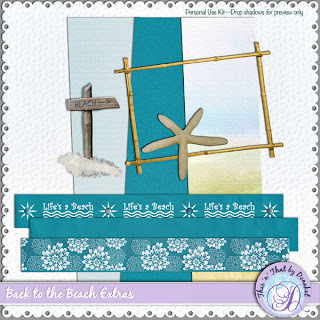 The nice thing about a template like this is that you can substitute your own photos or cards into the spaces, or just use papers or embellishments from the kit to fill the spots on the template. The link for the extras is at the bottom of this post (more papers and journalcards). Enjoy! 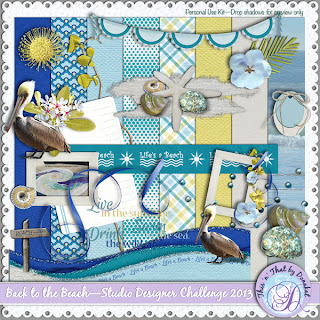 This round, the challenge in the Next Designer Contest at Digital Scrapbooking Studio was to make a minikit in the style of Art Journaling, very popular now, especially with traditional paper scrapbookers and other people just interested in making personal journals with paint, pens, paper, and lots of other materials. So, this kit has some interesting things to help you make layouts that reflect that style. It's available for download through the links in the gallery at Digital Scrapbooking Studio here. And here's the leftovers that you can pick up to go with your kit. They include the handy Photoshop glitterstyles (style strip available for Photoshop Elements users, too) and two solid papers. Well, it's been a while since I posted anything, so here's a new kit for you. 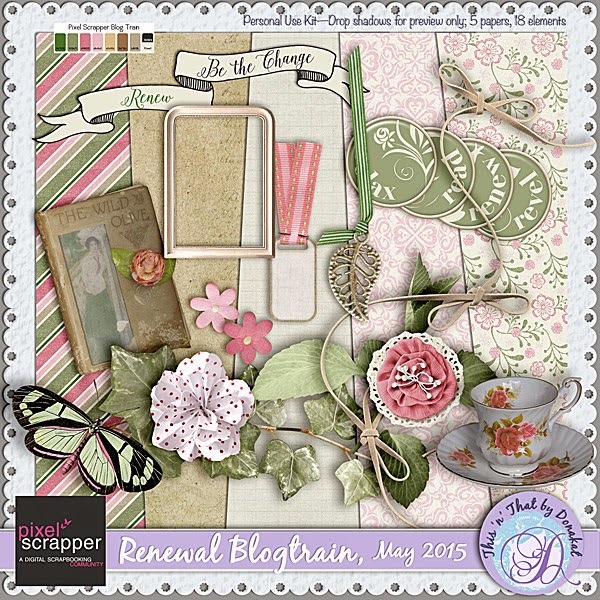 It's part of the Blogtrain hosted at Pixel Scrapper, with some lovely springtime colors and a theme of "Renewal." 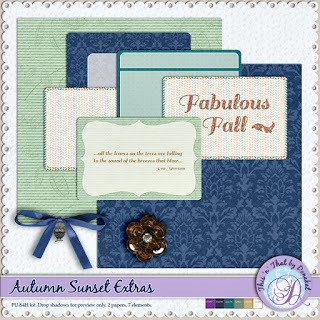 There are lots of free coordinating kits to be had by following the blogtrain; you can see the schedule at Pixel Scrapper. Hope you enjoy my part! I have a new minikit available, Vintage Christmas, free at this link: http://bit.ly/1crteyf. 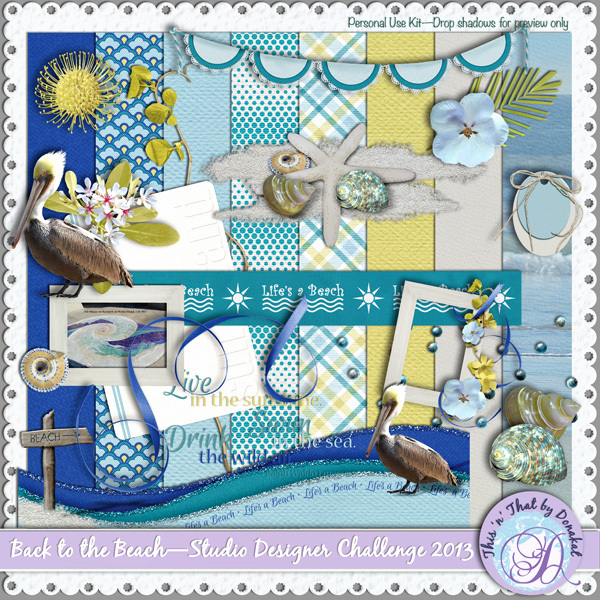 It's this month's entry in Digital Scrapbooking Studio's Color Challenge. Check out the challenge here. I hope you enjoy scrapping with it! There may be more to round out the kit later. 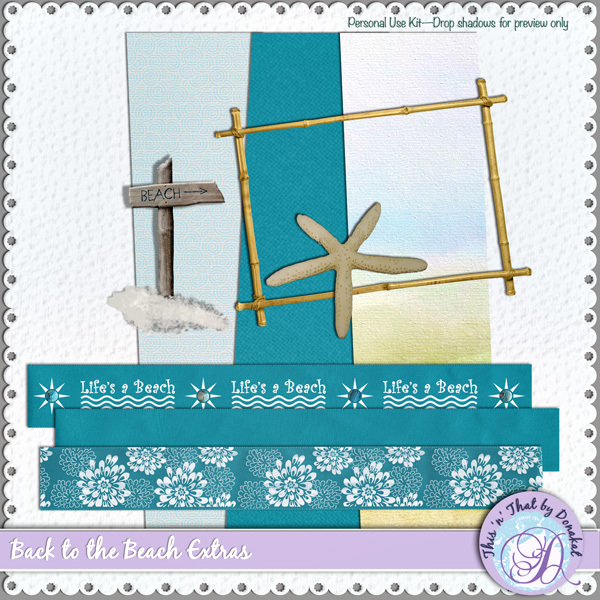 Back to the Beach kit and Extras! The second round of the Next Designer Contest at the Studio is underway, and my kit and extras are ready for downloading. I bet you’ve still got plenty of those summer beach pictures waiting to be scrapped. This kit should bring back those memories and complement your photos. You can see all the kits for this round (and tomorrow the voting begins) at the Studio. The links for the downloads are with my submission there. The link for the extras is below its preview on this page. Happy scrapping! I'm a retired desktop publisher, involved in family history research for over 25 years, and an avid digi-scrapbooker. I live in beautiful Southern California and love to travel with my husband and visit my darling grandchildren (and their parents). They are prominently featured in my scrapping, as are our travels and our ancestors. ©2011, Dona K. Ritchie. 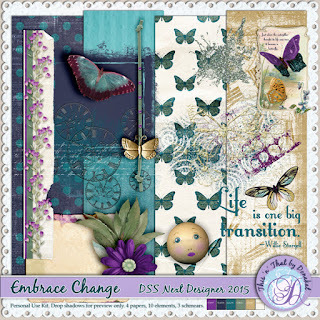 Template background & header from Sweet Sweet Dreams by Mary Pop Designs. Powered by Blogger.